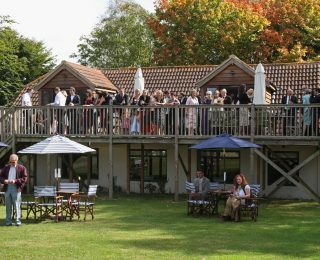 Home to more than 150 birds of prey, a variety of function spaces and an idyllic countryside setting, the Hawk Conservancy Trust is a unique and special venue ideal for any occasion. 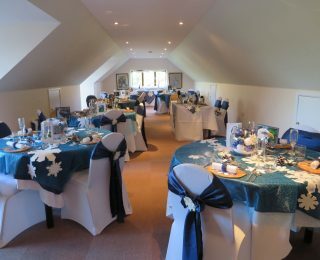 From small corporate workshops to children’s birthday parties and weddings, we can accommodate your needs as well as offering some unique extras. Treat your guests to an event they will never forget and relax in the peaceful tranquillity of our grounds for your stress-free event. An exceptional day needs an exceptional venue and there are few places that can match The Hawk Conservancy Trust for a magical and unforgettable day. Could you imagine your wedding rings being delivered by the graceful flight of an owl? Or perhaps you'll find it hard to believe that you could be standing in a stunning wildflower meadow for your wedding day photographs? At The Hawk Conservancy Trust, we're able to make all your wedding day dreams come true – and more. From a simple ceremony for a few guests to a lavish celebration with a full wedding breakfast, our choice of wedding packages can all be tailored to suit you. After all, it's your special day! From private functions to family occasions, there's nothing like a party surrounded by 150 birds of prey! Our enchanting grounds are a wonderful location, day or evening, for any celebration. It's a special experience to handle a bird of prey on your birthday or to combine a flying display with an anniversary. You can enjoy a tailored dinner in our own Feathers Restaurant or pop a champagne cork from a beautiful balcony – we'll even supply a cake! Children's birthday parties can be made more magical with specially delivered messages flown 'Harry Potter-style' from an owl and you and your guests can enjoy all of the Trust's flying displays and attractions whatever the occasion. Our peaceful and natural surroundings at the Hawk Conservancy Trust, provide an inspirational location for all corporate events and functions. Whether it's a meeting against the backdrop of soaring vultures over our Savannah Arena, a team building exercise complete with live birds of prey, or simply a work's day out, the Trust offers a truly unique experience for every corporate occasion. All corporate bookings include access to the whole of the Trust and our award-winning displays. 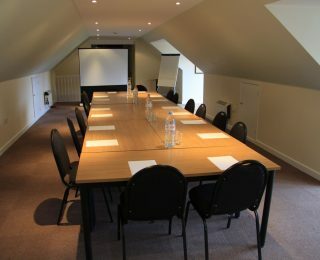 We can tailor events to your individual specifications and our purpose-built Griffon Rooms are perfect for presentations and meetings. The Trust is fully licensed and our bright, modern Feathers Restaurant and its fabulous food can be adapted to meet all of your needs. 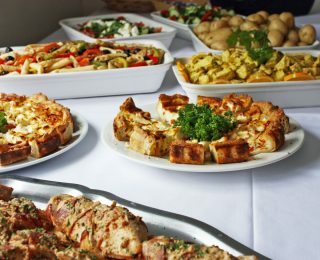 From a working lunch and barbecues to children's birthday parties and sophisticated wedding breakfasts, we offer a range of catering options to perfectly suit the needs of you and your guests.